The Italian daily Corriere della Sera has commented on the counter-sanctions imposed by Russia on the EU, USA, Canada, Norway and Australia. Russia has blocked the imports of most food products - the value of which, according to Corriere della Sera, is around 31.3 bln euros - into these countries for the period of one year. The total value of food products imported into Russia is 52 bln euro. Interestingly, the counter-sanctions imposed by Putin have not affected the market of luxury goods, automobiles or spirits, which means that the exports from major EU member states to Russia will drop only slightly. According to the European Commission’s projections, the total imports of goods from Germany will fall by about 1.7%, from the UK - by 0.85%, from France - by 3.1%, and from Italy - by 1.7%. 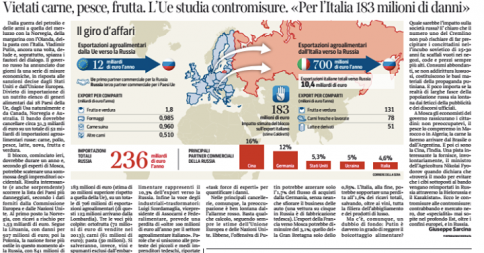 Corriere della Sera is also pondering the possible impact that these counter - sanctions may have on the Russian society. Is Putin really prepared to boycott almost all the imports of food products from the EU? How will the people react to the threat of empty store shelves? Economists in Moscow seem confident that this gap can be bridged with increased imports from other countries, and they talk of strict controls in order to thwart any indirect imports from the embargoed states through Belarus or Kazakhstan. In reality, however, says Corriere della Sera, this will facilitate the development of a black market and give rise to corruption: The very two diseases that Russia seems unable to shake off.